Marvel revealed the latest full trailer for Thor: Ragnarok during the Marvel Hall H Comic-Con panel earlier today. The first trailer for the movie debuted back in April with a very fitting soundtrack courtesy of Led Zeppelin's "Immigrant Song" and fans have been clamoring for more Thor since then. Rumors have been swirling about the new trailer and the possibilities of the answer to a Marvel mystery after news spread that the new trailer was complete. While the Thor trailer's appearance at the Comic-Con may have been spoiled, the information contained within the trailer remained intact. Mark Ruffalo, the Hulk himself, took to social media a earlier this month to say that the new Thor: Ragnarok trailer was complete, leading many fans to believe that the trailer would debut at last weekend's D23 Expo, although, instead, it debuted at Comic-Con. Mark Ruffalo hinted that the trailer might solve the mystery of whether the Hulk or Thor won during their fight. While the trailer doesn't spill the beans on the epic fight, it does look spectacular and does what a trailer is supposed to do: make you want to see the movie and see it as soon as possible. 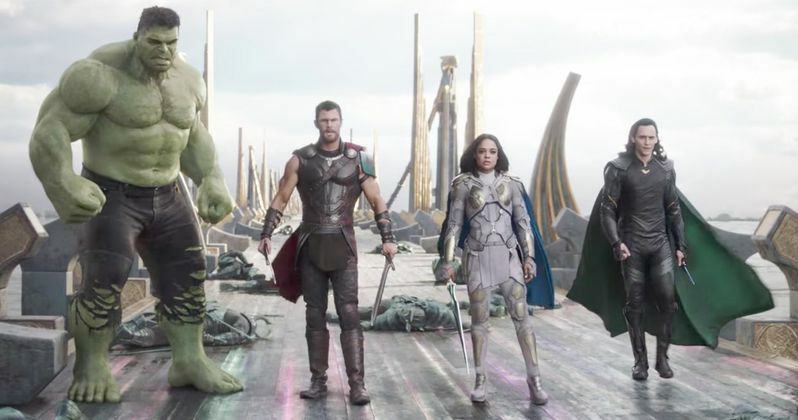 Thor: Ragnarok is reportedly set to directly connect with Avengers: Infinity War, so it won't be long now before we get a sneak peek into Infinity War as well. Disney and Marvel have been teasing just the perfect amount of footage for the new trailers and not going overboard trying to show the whole movie within the span of a couple of minutes. Even with the release of the new trailer it is still not clear what the exact plot points for Ragnarok will be. The intergalactic bromance between the Hulk and Thor is fully evident and should make for a pretty interesting spin for both characters as the movie progresses. The new full trailer comes after a new Thor: Ragnarok poster was spotted at the D23 Expo last week. Andy Park unveiled his official D23-exclsuive poster that featured Thor leaping towards the Hulk, ready to strike with a sword while the Hulk looks prepared to take Thor on without flinching. The movie finds the God of Thunder imprisoned on the other side of the universe when he gets pitted up against the Hulk, his former ally and fellow Avenger in order to return to Asgard in time to stop the villainous Hela and the impending Ragnarok. Thor: Ragnarok is all set to slam into theaters November 3rd, 2017, so the wait is almost over, but of course the new full trailer is doing its best to make sure that time is at a crawl before the movie premieres. Taika Waititi directed the movie with screenplay written by Eric Pearson, which is based off of a story that was written by Christopher Yost, Craig Kyle, and Stephany Folsom. The wait isn't too much longer, but in the meantime you can watch the first trailer that was released earlier this year in addition to the brand new full trailer that was released today thanks to Marvel Studios.